Matt and Kelly Vince have owned ‘Beluehills’ for under 10 years. The property consists of two land types; Narrow Leaved Ironbark Woodland and Softwood Scrub. The property size is 226 ha which has been extensively developed to allow for more efficient grazing. ‘Beluehills’ is located outside of Calliope. Since buying ‘Beluehills’, Matt and Kelly Vince have been keen to get the best outcomes from their grazing business. To ensure they were mindful of each aspect of the business and considering every available opportunity, Matt and Kelly completed Grazing Best Management Practice (Grazing BMP) assessment for their property. Once Matt and Kelly completed the Grazing BMP modules, they decided to take the next step and become Grazing BMP accredited. The Grazing BMP program is a free and voluntary online tool designed to help landholders improve the economic, environmental and social sustainability of their grazing enterprise. The program enables producers to self-assess their management practices and identify opportunities to improve business performance. After participating in the program, Matt and Kelly started conducting forage budgets and landscape analysis using the ABCD land condition assessment framework. These management practices have enabled Matt and Kelly to monitor their stocking rates and assess their carrying capacity through the non-grass growing season objectively, ensuring sustainable pasture utilisation and optimal landscape health. A tool that helped Matt and Kelly obtain a robust perspective of landscape health was the ground cover reports provided by VegMachine. Used in conjunction with land condition, forage budgeting and rotational grazing, the VegMachine ground cover reports have enabled Matt and Kelly to monitor their grazing strategies and stocking rates accordingly. Matt and Kelly are now confident with their skills of pasture assessment and use them every time the cattle are moved through the rotational grazing program, adjusting the stocking rates accordingly. While going through BMP accreditation, Matt and Kelly took the opportunity to focus on their business. This included developing a business plan and a whole property plan that included business and personal goals, natural resource goals and future development. An essential goal for Matt and Kelly was to critically assess and determine the most appropriate cattle enterprise for their business. Economists were contacted and several economic scenarios were conducted using the Breedcow, Dynama, Bullocks and Cowtrade software packages. These programs are designed to plan, evaluate and improve the profitability and financial management for extensive beef cattle enterprises enabling cattle producers to evaluate the economic impact of a change in grazing practices. Two Department of Agriculture and Fisheries (DAF) Economists together with two DAF Beef Extension Officers visited Matt and Kelly’s property to run them through several Breedcow scenarios. 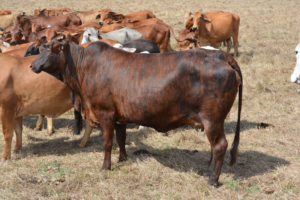 The first scenario analysed the current situation for ‘Beluehills’ — running a breeder herd, sending all the weaners to the saleyards at weaning and buying in replacement breeders as required. The second scenario changed the business focus to buying the weaners from the breeder operation at 230 kg live weight, to keep and fatten, then sell to saleyards at 350 kg live weight. The ‘Bullocks’ program was used to analyse this system with a separate spreadsheet for the heifer and steer portion of the herd due to their differing growth path and market price. The third scenario involved trading steers, which was also completed in the Bullocks program. Lastly, the fourth scenario consisted of selling existing breeding stock and using the available capital from the sale to purchase steers, then continue as a trading operation. These scenarios enabled Matt and Kelly to analyse which information they could use to make decisions on the enterprise that would best suit them. Matt and Kelly then set a firm direction for their business and established business and personal goals accordingly. Cash flows, profit and losses as well of a statement of position were also completed as part of the process. Matt and Kelly believe that going through BMP accreditation has benefited their business management approach. Many of the plans for the business had not been documented in the past, whereas now they feel they have a solid plan for the future. 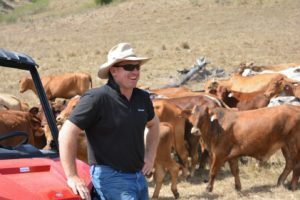 The tools that Matt and Kelly have gathered through the Grazing BMP process has enabled them to assess their business’s future economic and environmental sustainability. Click here to find out more about the Grazing BMP Program. The Grazing BMP program has been delivered in the Fitzroy region since 2009 and has engaged more than 780 grazing businesses managing more than 4.9 million hectares of country. Grazing BMP, supported by the Queensland Department of Environment and Science, is a partnership between DAF, Fitzroy Basin association (FBA) and AgForce. The program is a free and voluntary online tool designed to help landholders improve the economic, environmental and social sustainability of their grazing enterprise. The program enables producers to self-assess their management practices and identify opportunities to improve business performance. In the Fitzroy Basin, the Grazing BMP program is delivered in a two-day accelerated workshop format. Over the course of the two days, DAF and FBA staff present best practice information and encourage group discussion. These workshops are highly interactive and attendees are encouraged to learn from group discussion. Graziers are able to reassess their modules every year to refresh their action plans, and maintain their knowledge of industry standards. Reassessment workshops are held over one day and feature guest presenters and topics that aim to further the knowledge base and improve practices of those attending. VegMachine.net is a website designed to help primary producers measure and understand changes in the health and productivity of their grazing land. The website is free and simple to operate. It uses world-leading satellite data sets and can be used to evaluate an entire property, a particular paddock, or even a small patch within a paddock. Ground cover, a specialty analysis service provided by VegMachine, is an important indicator of the health and productivity of grazing land. Land that maintains ground cover is generally healthier, erodes less, captures more rainfall and ultimately grows more grass. As ground cover fluctuates from season to season, VegMachine can help land managers to see beyond these seasonal fluctuations to better understand the impacts of their land management strategies. What is the most profitable age of turnoff? What is the best selling strategy when forced sales are required? What is the most profitable balance between heifer culling rate and mature cow sales? Breedcow and Dynama are free programs that are enabled to be downloaded for free from the DAF website.